The N-terminal domain of the chemokine CCL5/regulated upon activation normal T cell expressed and secreted (RANTES) has been shown to be critical for its biological activity on leukocytes. Several N-terminus-modified CCL5/RANTES derivatives, such as N-Terminal truncated CCL5/RANTES, Met-RANTES, and amino-oxypentane (AOP)-RANTES exhibited antagonist or partial agonist functions when investigated on the properties of their receptors CCR1, CCR3, and CCR5. Studying 95 African samples from Cameroon, we found a naturally occurring variant of CCL5/RANTES containing a missense mutation located in the first amino acid of the secreted form (S24F). S24F binds CCR1, CCR3, and CCR5 and triggers receptor down-modulation comparable to CCL5/RANTES. Moreover, in CCR5 positive cells, S24F elicits cellular calcium mobilization equivalent to that obtained with CCL5/RANTES. By contrast, S24F does not provoke any response in CCR1 and CCR3 positive cells. 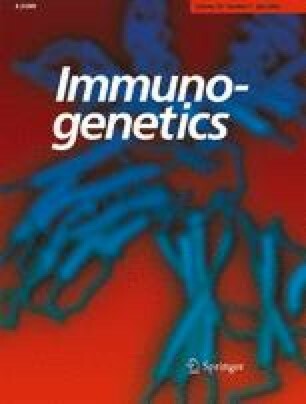 As CCL5/RANTES is able to attract different subtypes of leukocytes into inflamed tissue and intervenes in a wide range of allergic and autoimmune diseases, the discovery of this natural N-terminus-modified CCL5/RANTES analogue exhibiting differential effects on CCL5/RANTES receptors, opens up additional perspectives for therapeutic intervention. Nucleotide sequence data reported is available in the DDBJ/EMBL/GenBank databases under the accession number: DQ230537. We would like to thank Dr. Pierre Beguin for the synthesis of the wt and mutated CCL5/RANTES recombinant proteins and Dr. Dorian MacIlroy for his careful editing of the manuscript. The authors also wish to thank Drs. Littman and Deng, and the Centralised Facility for AIDS reagents supported by the EU Programme EVA/MRC (contract QLKZ-CT-1999-00609) and the UK Medical Research Council for providing U87-CCR1, U87-CCR3, and U87-CCR5 cell lines. Thanks also to Dr. Marc Alizon for helpful discussions. This work was supported by the French National Agency of AIDS Research, ANRS. Anfumbom Kfutwah was supported by a fellowship from the French Ministry of Cooperation, SCAC, Yaoundé, Cameroon.